Our heavy-duty, high-quality tool steel molder head is the best on the market! It offers a ball and setscrew alignment system that automatically positions the knives and locks them in place. 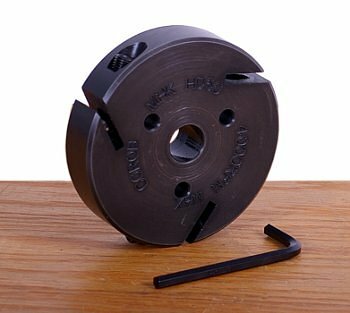 Mounts to any 5/8-inch spindle on table saws with a maximum of 4,000 rpm, or to a 5/8-inch molder/dado arbor for use on the Shopsmith Mark 7 or Mark V. Use with the molder table insert. Note: Not for use with the Shopsmith ER, MR or or older Mark VII. Note: Molder heads shipped now (September 2011 or later) require newer style, thicker molding knives.